Thursday was my speedwork day and it was .... speedy. It was meant to be faster than my goal pace for the upcoming race with the following targets/results: 1200m-5:38/5:33, 800m-3:45/3:38. 400m-1:53/1:44, 200m-:50/:49. Some fast strides followed and my legs, hams, quads and hips felt as loose could be; very challenged by the effort. My attention was not exactly all there though - for non-running related reasons - and I somehow skipped my second 400m repeat. I could not believe it when I checked the watch later but, for sure, I forgot. Friday was a travel day. This weekend I am in Lara Country - New York State - although nowhere near her on her mountain retreat. 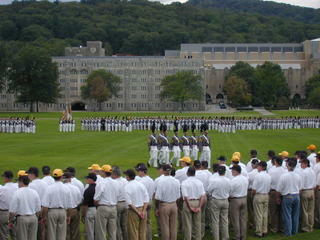 I am in West Point for a football game and visit with son T. who is doing quite well at the academy. I sure fed him well today (Saturday). The game was excellent even though Iowa State pulled it out in the fourth quarter. I retreated to the hotel so late that I slept in; something so foreign to me that I forgot what it felt like. In fact I said forget it when I asked myself to figure in time for a 5-mile run. Instead I spent more time with T. We made plans for tomorrow though. We're going to Camp Buckner t o run the tow trails that he and the cadets train on during the summer. And did I say there are hills in Florida? Forget it. They're speed bumps in comparison to what I will put myself through tomorrow. I can't wait to see how I come back to this forum to describe what I go through. So despite all the forgetting, I am still on track and training. I hope yours is going well too. I'm sure T. loves having you visit. Don't try to keep up with him on those hills or you might do what I did and pull something. Take care. Great pictures David - sounds like a great time with your son. Good luck on those hills. Nice work on speed training! Nice photos. Hills are character builders!! now wait just a minute here...mountain goats? c'mon. the 'hills' in new haven weren't that bad! and if you want hills, run with jeff. that man is part mountain goat himself, I swear. sounds like you had a great visit, i'm sure our son loved the time you spent with him. 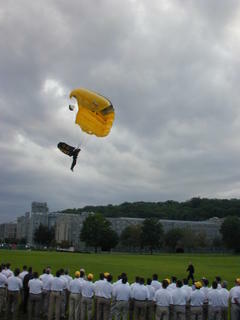 Go Navy! (Hey, Trinity was D III. I've got to take what I can get). West Point's stunning, though. I remember being completely blown away the first time I drove the Hudson Valley. Being raised mostly a southerner (and somewhat a Michigander), I'd thought that Sesame Street represented pretty much all of New York State. Living upstate completely changed that - what a great place. I hope the trail running went well. It’s awesome that you and your son can run together!